Siam Rehab Thailand is a drug and alcohol rehabilitation centre in Northern Thailand serving English speaking clients from around the world. Siam Rehab offers an affordable world class and drug and alcohol rehab programme in Thailand. Also serving our Dutch and Belgium clients with a drug and alcohol admissions and aftercare centre in Bussum, Netherlands. 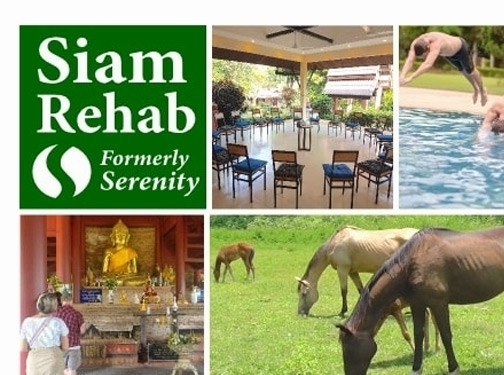 Siam Rehab is located in the beautiful Mae Chan valley of Chiang Rai which is the most northern province in Thailand. Siam Rehab is a full service treatment centre with detox, primary treatment, secondary treatment and aftercare to give you the best chance of successful recovery. Not only will you undergo an effective and life changing treatment we also provide for your relaxation time with some amazing Sunday excursions to experience some of the cultural and fun activities available in our local area. If you or someone you love is struggling with drug or alcohol addiction you should contact Siam Rehab now. Thailand (Koh Samui) based business - established in 2014 - providing alcohold and drug addiction treatments. Website includes details of treatments provided, "meet the team" info, details of business premises, testimonials, FAQs, certifications gained, associations, contact form.